Cut&Paste is currently recruiting talented, hungry individuals seeking an opportunity to help Cut&Paste spread the stories of its designers. There are two open positions available in DUMBO Brooklyn, New York. For more information, check out the job descriptions and spread the word. Coming up in early August, we will be re-launching our website and announcing details for the upcoming 2011 Tour. Stay tuned and if you want to stay in the loop, sign up for our mailing list above. CONGRATULATIONS DAVE STOLTE, OUR 2D GLOBAL CHAMP! We would like to congratulate Dave Stolte, of Los Angeles for his big victory at Cut&Paste's 2nd Global Championship in the 2D competition this past Saturday. Dave took home the gold with his How-To Instructions on "How to See the World." With his crowning, Dave receives the opportunity to collaborate with Nooka as well as a copy of Adobe CS5 Master Collection. Great job, Dave!! CONGRATULATIONS MORITZ SCHWIND, OUR MOTION DESIGN GLOBAL CHAMP! We would like to congratulate Moritz Schwind, of Munich, representing Berlin for his big victory at Cut&Paste's 2nd Global Championship in the Motion Design competition this past Saturday. Moritz shook the audience with his story of Gaining Independence with his crown-awarding video below, telling the story of a robot breaking free of its bonds. With his win, Moritz receives the opportunity to collaborate with Converse as well as a copy of Adobe CS5 Master Collection. Feeling good, Moritz? CONGRATULATIONS EUGENIO GARCIA VILLAREAL, OUR 3D GLOBAL CHAMP! We would like to congratulate Eugenio Garcia Villareal, of Mexico City for taking the top spot at Cut&Paste's 2nd Global Championship in the 3D competition on Saturday. Eugenio designed his packaged Tongue based on the assigned theme of Free Speech . With his title, Eugenio will become a virtual "Designer in Residency" with Shapeways, the world's leading 3D printer, as well as receive a copy of Adobe CS5 Master Collection. Congratulations again, Eugenio!! SOME TICS LEFT... GET 'EM WHILE YOU CAN!! Afterparty: Gallery Bar - 120 Orchard St., New York, NY - map. Tickets: $15.00 online; $13.50 Block of 4 online; $20.00 at door; available on Eventbrite. 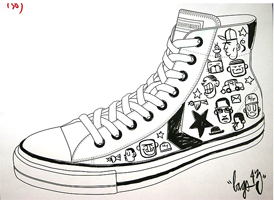 Converse and Cut&Paste are proud to announce a special gift for one of the artists from Converse's Audience Design Activity during the autumn 2010 Tour. Dennis Brown of San Francisco created his shoe design at the San Francisco event in October and Converse selected his design for a limited print. Check out Dennis's Portfolio. If you enjoyed drawing at Cut&Paste NYC, come out and contribute to Converse's drawing wall this Saturday. The first 120 artists to grab a marker and do it up will receive a free Converse t-shirt. Also, at the end of the night, each artist can take an individual square from the finished canvas. Cut&Paste is proud to announce its jury of acclaimed artists, designers, creative directors, and design media. They include Rama Allen of Digital Kitchen, acclaimed graphic artist, Jon Burgerman, Lori Cantu of Converse, Dave Chau of Big Spaceship, Matthias Hollwich of HWKN/Architizer, Cliff Kuang of Fast Company's Co.Design, Victor Newman of Bionic, Frederico Phillips of Tronic, Daniel Piwowarczyk of Lobo, David Schwarz of Hush, Matthew Waldman of Nooka, and Michael Waldron of nailgun*. We look forward to seeing who they crown on April 16th! 2D Design: In awarding the grand prize, Nooka will develop a new watch collaboration with the champion to be produced in limited quantity. 3D Design: Shapeways, the leading 3D printer will work with the champion as a "Designer in Residence," (physical or virtual) mentoring him or her to design, prototype, and prepare their new creation for market. Motion Design: Converse, the leading source for kicks and the the 2010 Cut&Paste Global Sponsor, will award the champion the opportunity to collaborate on a special motion design project. All champions will also receive a copy of Adobe Creative Suite 5 Master Collection. Afterparty: Gallery Bar - 120 Orchard St., New York, NY - map. Also with open bar tils runs out (thanks Media Temple!). Show event bracelet for open bar. It is our pleasure to announce that Cut&Paste will hold GLOBAL CHAMPS 2 on April 16th at Webster Hall. The 2nd annual tournament bringing 30 designers from around the world to compete on one stage will hold its Show&Tell presentation series starting at 6PM and doors will open for the Main Event at 7PM. More details and updates can be found at the Global Champs site here and advance tickets are available now at EventBrite. Head on over to our Facebook page to check out the photos from the last tour stop for the 2010 Digital Design Tournament in Tokyo. The final three winners have been selected for Global Champs in February and in the time leading up to the big event we'll be sharing video recaps from all ten tour stops so make sure to check back soon! The final tour event is at hand. Coming to you live from Tokyo the last group of designers will be competing for their chance to come to New York in February for the Global Championship. Starting at 8PM local time, 6AM EST, Cut&Paste Tokyo will be available on to watch live at justin.tv/cutandpasteme. Don't miss any of the action in 2D, 3D and Motion design! Cut&Paste continues to roll through Asia with one final tour stop to go, this Saturday in Tokyo. While all that action will be on justin.tv, before Saturday see where we've already been through all of our Facebook galleries. The latest addition is to the Bangkok event that went down on Dec 2nd. Selects are on the Bangkok event page with the full gallery at Facebook. Tag yourself and comment and be sure to become a fan for all the updates. Making the second stop on the Asian leg of the 2010 World Tour, Cut&Paste comes live from Seoul at 8:00PM local time December 4th, at justin.tv/cutandpasteme. For those back in the states you can catch the action at around 6:00am EST time and kick of your day bright and early with a little design action. Don't miss it! The outdoor Cut&Paste event in Sao Paulo drew huge crowds and a full evening of activities culminating with truly great live design battles. The photos are now up for you to check out all of the fun the audience had. Selects can be previewed at the Sao Paulo event page with extended galleries over at Facebook. The next tour stop is this week, with Cut&Paste making its first stop on the Asia leg of the tour in Bangkok on December 2nd. All tickets will be available at the door for 300 THB with each ticket coming with a 300 THB food and drink voucher redeemable at the venue. Check out all the action at Tiger Beer Park @ Central World. Doors open at 18:00 pm. For full information about the event check the Bangkok page here. All of the motion clips are live over at Vimeo, and we'll have 2D and 3D artwork up soon at the Sao Paulo events page. Our apologies to anyone who tried to tune in to the live webcast. We experienced some problems early on but will have the full show available for live stream soon. Stay tuned...Cut&Paste heads to Asia this week with the Bangkok event on December 2nd! SAO PAULO: LIVE TONIGHT ON JUSTIN.TV! Don't miss a minute of the action as Cut&Paste comes to you live from Sao Paulo. Our 7th tour stop on the Digital Design Tournament with action and competition in 2D, 3D and Motion design. Starting at 8PM local time, 5PM EST at justin.tv/cutandpasteme. And don't forget to be a part of the conversation with Cut&Paste on Twitter! Click through to the Mexico City page and check out photos from the event! Be sure to click through the 2D, 3D and Motion tabs to check out all the winning work and results for each category. The next event is this Saturday in Sau Paulo Brazil with a live stream of the event from 7PM-10PM local time (4PM-7PM EST) on justin.tv/cutandpateme. Don't miss it. UPDATE: Our apologies for any problem you may have found with the live stream. The web access at the venue in Mexico was lot during the show and our stream never ran. We will have the entire show available for on-demand watching soon. New photo galleries on Facebook! Be sure to stop by our Facebook page to check out the photos from our European tour stops in London and Berlin. Two galleries showcasing a great time across the pond. Results for both cities are also now live on the London and Berlin event pages. Click through the 2D, 3D and Motion tabs to check out all the results. The tour continues on next to Latin America with a show tonight in Mexico City, followed by Sao Paulo on November 27th. Tune in to justin.tv/cutandpasteme to catch our live stream of tonight's show in Berlin! Show begins at 8pm local time, 2pm EST. Cut&Paste returns from back-to-back shows on the West Coast in San Francisco and Los Angeles with designers crowned in both cities and ready to take on the world at Global Champs. We have some fantastic photos on the SF and LA event pages and even more for you to check out on our Facebook page. Be sure to comment and tag yourself in any of the photos if you made it out. To see even more stellar coverage don't miss the photos from our LA judge, Bobby Hundreds and his Hundreds affiliate, Natalia Brutalia. A big thank you to all of our Show&Tell speakers who took time out of their schedules to be a part of the show and a special congratulations to all of our winners. To check full details and to see the work from the competition visit the San Francisco and Los Angeles event pages. With the US tour wrapped up Cut&Paste prepares to take the Digital Design Tournament to the rest of the world. Deadlines are fast approaching in each region with the European deadline for London and Berlin being extended to October 29th. For designers in Asia and Latin America looking to shine in the spotlight of our stage, we are giving you a little more time to get in on the action and extending the entry deadline to November 5th. Don't miss out, ENTER NOW! Saturday night was an epic battle of design greats in New York. We have event photos live now on the New York event page with all the winners details coming later today. We'll also have extended galleries over on our Facebook page later this week. San Francisco and Los Angeles! Cut&Paste makes its west coast swing this weekend with two great shows lined up. Tickets are still available Oct 8th in San Francisco and Oct 9th in Los Angeles. Both shows feature 16 of the best designer your city has to offer battling it out in 2D, 3D and Motion. Both cities will feature unique Show&Tell presentations curated by Cut&Paste partners before the main events so make sure to arrive early and enjoy an insiders look at the design process. In Los Angeles we''l also have a special early bird Media Temple open bar from 7Pm till gone AND an after party with open bar. We have great judges lined up for both cities including Stacy Nimmo the founder of gunshop.tv in SF and streetwear staple Bobby Hundreds of the Hundreds in LA. For full details check out the event pages for San Francisco and Los Angeles! 2010 Digital Design Tournament kicks off this Saturday! Hey New Yorkers! We hope you have your tickets and are prepared for not-to-miss show this Saturday October 2nd–tell a friend. In addition to 16 talented designers competing in 2D, 3D and motion before the main event we have Show&Tell speakers curated by Maxon and Core77 taking the stage at 6PM followed by an open bar from Media Temple at 7PM and an Converse audience design activity to keep you inspired all night long. And oh yeah... after party with another open bar til it runs out by Media Temple ? Check out full details here with info on our esteemed judges including Eric Haze, Greg Rivera of Mishka, Chad Philips, Rama Allen of Digital Kitchen and more. Can't make it to the show this weekend? We'll have a link to the live webcast right here on the homepage Saturday night. Sorry, no open bar on the webcast. CUT&PASTE NYC THIS WEEK! LA & SF NEXT WEEK! To all US designers still recovering from Labor Day - if over the last few weeks you've been away in your ashram, communing with nature, or finishing up summer in an outdoor beer garden, we figure you need one more week. The extended deadline is September 17th for all US entries. Test rounds will be held the weekend of SEPT 18-19. Thanks to all of you have entered so far. Your portfolios are very impressive and test rounders will be contacted starting this week. The deadline for entries in the US (New York, San Francisco, and Los Angeles) is coming up SEPT 10th. If you'd like to compete in 2D, 3D or Motion, get your entry in. As an added bonus anyone who enters and all ticket buyers will be receive a free a one-month subscription to Stash Magazine, to gain instant and unlimited access to the world's largest online video reference library of Animation, VFX and Motion Graphics with new issues released every month. Manila Design Week 2010 WRAP! The 2nd annual Manila Design Week was an insane show! We ran out of the Manila Beer and the onstage artistry went strong. Check out the work and pics here. Coming up on Tuesday, August 10th, C&P rubs elbows at Asia’s best kept secret design festival – the 2nd annual Manila Design Week. MDW’s growing program boasts speakers worth listening to including Tara McPherson, along with our boys Alvin and Jackson Tan of Phunk Studio. They know how to advertise themselves too! With the support of presenting sponsor, Manila Beer and Power Mac Center, Cut&Paste will be in the mix with a special live design exhibition of 2D and Motion Design. If you’re in Manila, come join us at 8PM at the Collective, located at 7274 Malugay St. in Makati City. Artwork, videos, and photos to come after the show! Digital Design Tournament 2010 is back and it's tight! Cut&Paste is back with the 2010 Digital Design Tournament, a live action battle in 2D, 3D and Motion design facing off the best of the best across ten cities worldwide. Once again the finalists from all international events will converge in New York to conclude the tour with the Global Championship, where one winner in each field will be crowned the victor. This is a design battle royale to launch designers into the spotlight and offer the audience the unique experience of sharing the creative process. This year’s tour will extend beyond the stage with audience meet and greets and the Show&Tell series, presenting an insightful how-to with some of the brightest minds in the design community. Find out when Cut&Paste is hitting your city and if you’ve got the skills to take on the world, register now! Material on this website is copyrighted and may not be copied, reproduced, distributed, republished, uploaded, posted, or transmitted in any way without the prior written consent of the copyright owner. Copyright © 2010 Cut&Paste. All rights reserved.